What word would you put in the blank? Like a spring whose waters never fail” (58:11). 1. 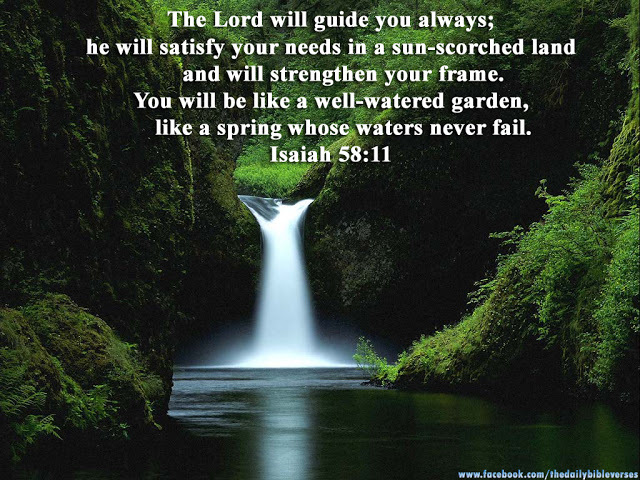 The Lord will guide you always. God is omniscient—He knows everything (Psalm 139:1-6), including every detail of your situation and the people involved. God is righteous—Everything he does is good (Deuteronomy 32:4). He can be relied upon to lead you down a perfect path. God is merciful—He responds in loving compassion (Psalm 116:5). He’s your understanding Father, your strongest ally. God is truthful—All that he says can be trusted (Titus 1:2). He will not lead you astray. God is faithful—He keeps his Word (Psalm 33:4). God does not lie or forget what he said. Neither does he change his mind. Notice that first phrase says God will always be your guide. Not every once in a while when you’re really in a quandary, but always. You are never left alone to your own devices—unless that’s the way you want to live. God is a gentleman; he leaves the choice up to you. 2. He will satisfy your needs in a sun-scorched land. Not he might satisfy your needs if he feels like it. He will. No matter what the landscape of your life looks like, God will see that your needs are met. Have you ever been surrounded by sun-scorched land, perhaps a desert or wilderness where no life is visible? Steve and I visited Israel a number of years ago. One of our tour stops was in the Judean wilderness—a desolate and foreboding sight to behold. Not a single tuft of grass. No bushes or plants of any kind—not even cactus. Only two things are visible when standing in the midst of this desert: sky and pale gray-brown mountainous rock, as far as the eye can see. Should you decide to live there, you’d have to bring with you everything necessary for survival: all your food, water, and clothing. For shelter, you might find a cave. Ah! But what if there was Someone there ahead of you? Someone who already had at his disposal the supplies you required? And they would never run out? That’s the life-giving, unfailing provision of your Heavenly Father. Let’s you and me rest in the assurance that the essentials—and even many delights!—will be generously supplied. If something is meant to be, he will take care of it—just as he’s been doing since each of us was born. Think how he has led you through the wilderness of broken relationships and difficult circumstances. His grace has been sufficient for every challenge (2 Corinthians 12:9), right? Now project that assurance into the future. Even if we walk through the valley of the shadow of death, we have no need to fear. Our all-powerful God is with us (Psalm 23:4)–guiding and providing. Heavenly Father, I praise you that day by day, moment by moment, you are delighted to guide us in perfect wisdom. You generously provide for our needs and lovingly care for us body, soul, and spirit. Thank you for your compassion, your faithfulness, and grace to see us through the wilderness valleys. “I trust in you, O Lord; I say, ‘You are my God. My times are in your hands.’” (Psalm 31:14-15a). Please come back on Monday. We’ll meditate on the second half of Isaiah 58:11.
love the encouragement and reassurance in your words and in His word. 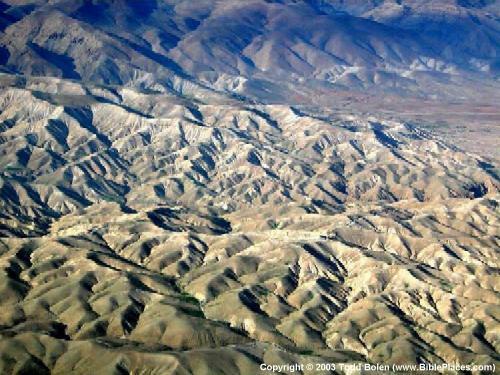 Just seeing the Judean wilderness I certainly agree – what a dry and desolate place that is. Thank you, Jean. Isaiah 58:11 surely falls into that category of encouragement and reassurance. For me, it’s a powerful verse to hang onto! Great verse to dissect! Looking forward to reading Part II! The best part of belonging to Christ is found in this verse! Thank you, Cheri. Yes, this verse does indeed highlight the love and care of Father God, made available to those who have accepted his Son into their lives..